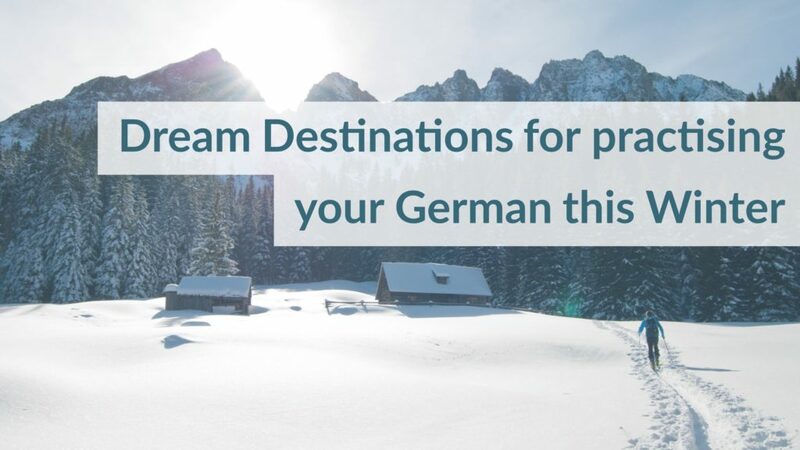 There is a myriad of winter activities on offer across the spectacular resorts in Germany, Switzerland and Austria and so many chances to try out the German you’ve been learning. From snow-boarding to bob-sledding, “fat bikes“ to swimming (yes, outdoors, in winter!) there is something for everyone in the winter playground around the Alps. If you hit the slopes this winter, it can be a great opportunity to practise your German – as you buy your lift pass at the foot of slopes, heat up with eine heiße Schokolade you order midway through your day or relax and chat with friends in a restaurant am Ende des Tages. We hope you find as your skis are going downhill, your language skills are reaching new peaks. Garmisch-Partenkirchen lies on the the border between Austria and Germany and is home to Germany’s highest mountain, the Zugspitze. It has more than 40km of ski runs on offer as well as Kinderland for beginners. If high octane sport or entertainment is more your thing, then the same resort has a Sprungschanze or ski jump. The New Year sees the Four Hills Tournament, where adventurous winter athletes ski off the end of a 140m jump at almost 100km/h. Auf die Plätze, fertig, los! Do you prefer your winter sports at a more leisurely pace? The Salzkammergut in Austria provides a picture postcard setting to try Langlaufen or cross country skiing. While not as speedy as its more traditional downhill cousin, cross-country skiing gives participants a fantastic work out, over a longer period and the opportunity to enjoy panoramic views of lakes and mountains en route. You hopefully still have enough breath to carry on a conversation auf Deutsch with your fellow Langläufer as you wend your way through the picturesque landscape. Another gentle activity to try is snowshoe hiking. The large surface area of the shoes lets walkers make their way through the magical snow scenes with minimal effort. Walking and talking, in German, can make the kilometres pass more quickly. There are many guided walks and trails in the Tirol for hikers to experience the freshest air, in untouched snow, at their own pace. Take a deep breath and enjoy! Do you fancy trying something a bit new and different? Möchten Sie etwas anderes ausprobieren? What about “fat-bikes”? Their name refers to the wide tyres that give extra grip on icy terrain. Not for the faint-hearted, this sport is available in Gstaad, Switzerland, alongside airboarding, where intrepid souls hurtle down pistes on a piece of equipment that’s a cross between an inflatable toboggan and a body board. If outdoor swimming in the winter months appeals to you, then there is no shortage of spas across the Alps. Can you imagine your delight at being able to ask for a massage in German? The steaming pools cater for swimmers all year round, meaning those bold enough to make the short walk outside can appreciate the Alpine views, while revelling in the warmth of thermal waters. Don’t forget your towel for when you get out! The more traditional winter pursuits of Schlittschuh laufen, Schlitten fahren und Skifahren are enjoyed in towns and resorts throughout Germany, Austria and Switzerland. For example, if the Outer Alster lake freezes in Hamburg in northern Germany, the inhabitants of the city enjoy this natural, open air ice rink as part of the Alstereisvergnügen. The town of Essen creates an ice rink in an old mining facility, beautifully floodlit in the soft winter sun. In Wien, die Haupstadt von Österreich, locals and tourists alike, sledge on the hill behind the Schönbrunn Palace in the city. Wouldn’t it be nice to get to know some local people as you all enjoy the winter snow together with a friendly wie geht’s? or Servus! Downhill skiing is what comes to most of our minds when we think of winter sports and Sölden in the Tirol, near the borders with Germany, Switzerland and Italy, is a scenic spot with miles of pistes to suit all abilities of skiers and many lifts over heights up to 3000m. Vergessen Sie nicht ihren Hut! The Weissensee or White Lake, near Klagenfurt in southern Austria, sees an early morning gathering of speed skaters whistle round the ice, making their noiseless pursuit look effortless and slick. You can hear the local people shouting words of encouragement to the speed skaters. What a great way to experience their culture! Some lakes in Switzerland freeze so solidly that ice hockey and curling can take place on them. One such place is the Obersee in Arosa, Switzerland, where skates can be hired throughout the winter and early spring for you to enjoy all sports on the ice in an idyllic setting. Hiking in the winter months brings us back to where we started, Garmisch-Partenkirchen. There are trails here suitable for all levels of walkers who enjoy the spectacular backdrop as they trek in the snow on a clear, crisp day. There are little Hütten or huts, dotted around the mountains if you want to spend the night on a longer hike, talk to German-speaking walking companions and if you want to enjoy incredible views over hills and valleys the next morning. 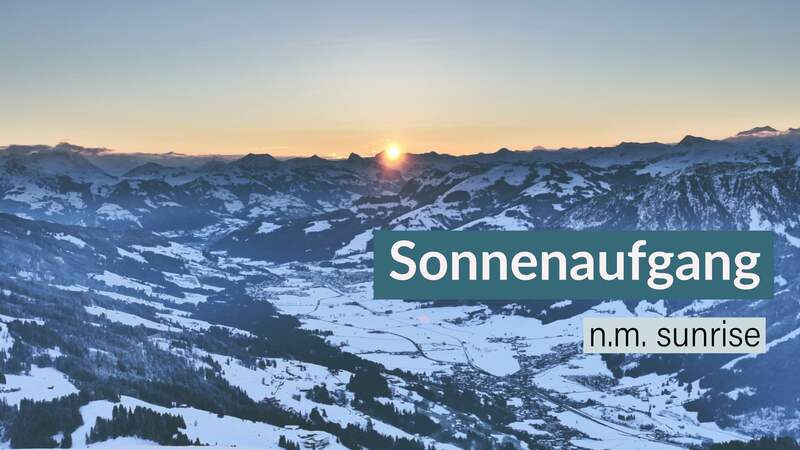 Genießen Sie den Sonnenaufgang! If all this talk of Alpine exhilaration has left you a little exhausted, will you still have energy for the part of winter sports some say they enjoy the most – the après ski? After a long day curling on a frozen lake in lovely Interlaken, bob-sledding in Berchtesgaden or para-gliding over the peaks in Obertsdorf, then the idea of some warming Glühwein in a cosy Weinstube might be very appealing. Or do you live by the motto “ski hard, après-ski harder”? A party atmosphere can always be found in St Anton and Ischgl in Austria. Wherever you go and whatever you may have the chance to do this winter, wir wünschen Ihnen viel Spaß! Are you a winter sports enthusiast? Do you have experience of visiting Germany, Switzerland or Austria in the winter months? Let us know in the comments. PrevPreviousNew Year – New One Minute Languages! We’re not having any sales over the New Year. We tend only to have one sale per year on Black Friday weekend.